With a little extra CSS, you can enhance your tooltips and hotspots on top of the customization in our basic style editor (located on your Theme page). Copy, paste, and edit the snippets below to take your flows to another level, but do not use body or html tags in the HTML component while building your flows as it may cause your flow to break or not show when the flow has been pushed live. Note: that our markup is subject to change. While we test our own styling operators across browser versions, we are unable to guarantee that your custom CSS will operate as expected. Changing the color of "Hide these tips"
You can modify the color of the font that allows users to dismiss a tooltip by adding the below snippet to the themes section in your dashboard. You can modify the color of the Close 'x' to better contrast with your application. Feel free to modify the color below, hex codes will work well too! 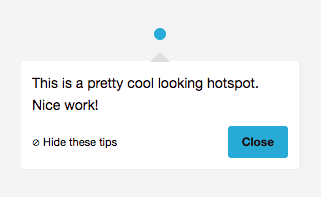 You can adjust the default width of hotspots and tooltips to make them larger or smaller using the following code. While we'd love to make the hotspot beacon available as a customizable setting in the Appcues UI, its not currently available. However if you're committed, you can modify the hotspot beacon style, using CSS in your application's code. The following is an example of how you might do that.